Itâ€™s August?Â I canâ€™t believe itâ€™s here already!Â Summer reading just ended–it canâ€™t be time for school to start.Â Iâ€™m in utter denial. I have yet to flip my office wall calendar; Pusheen will just have to eat ice cream in July for a while.Â At least thereâ€™s been time to sneak in a read or two before things are in full swing. These titles have been interesting reading.Â They’re a duo of teen(ish) non-fiction full of opportunities for starting conversations between teens and adults–something different than familiar, heavy duty topics of life choices.Â Whether youâ€™re a teen or a teen-adjacent adult, thereâ€™s something here for you. 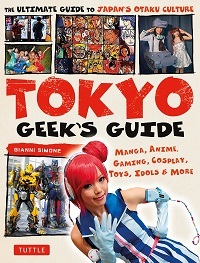 If youâ€™re a fan of anime or manga or have wondered what all the fuss was about, then try Tokyo Geekâ€™s Guide: Manga, Anime, Gaming, Cosplay, Toys, Idols & More by Gianni Simone.Â Although housed in adult non-fiction, this title has plenty of teen appeal.Â Itâ€™s also a fascinating glimpse into aspects of Japanese pop culture with a massive U.S. teen fan base.Â First and foremost, the book is a travel guide to hotbeds of otaku (superfans of anime, manga, and related subjects) culture in and around Tokyo.Â Even if youâ€™re unlikely to travel to Tokyo, this is a great vehicle for daydreaming or planning a virtual trip. Tokyo Geekâ€™s Guide offers vibrant colors and fun-yet-pleasing fonts across an engaging layout.Â Itâ€™s chock full of interesting information with plenty of maps and photos. It includes explanation of the different aspects of otaku culture for those who want it–more familiar readers can jump right into the book which is arranged by neighborhood.Â Various features highlight how to use the book, special activities and locations, and travel tips. There is a helpful glossary for newbies. Full of engaging content and aesthetic appeal, give this title to teens with an interest in anime, manga, cosplay, or Japan as well as to adults curious about otaku culture or with an interest in travel.Â Whether youâ€™re navigating a teen fandom or introducing your parents to your obsession, thereâ€™s plenty to chat about. At first glance, Ragginâ€™, Jazzinâ€™, Rockinâ€™: A History of American Musical Instrument Makers by Susan VanHecke is not an obvious choice for a teen audience.Â Yet, it surprises readers with a lively, colorful approach to a potentially dry subject.Â Both the text and layout are geared for middle school readers, but the book can still offer something to high schoolers.Â You can discover the stories of a handful of famous instrument makers and their creations from Steinway pianos and Hammond organs to Fender and Martin guitars.Â Band students will recognize Conn trumpets and Ludwig drums and Zildjian cymbals. Lots of engaging, creative illustrations catch the eye–photos of the makers and of musicians, historic ads, cutaways and patent drawings of the instruments.Â There is plenty to see here as well as read. The well-researched text wonâ€™t set the world on fire, but itâ€™s solid and could spark an interest. Above all, this title is a great tool for connecting adults and teens. Grab the book and head to YouTube to explore the instruments, the makers, and the music. Â (We fell down a Moog synthesizer rabbit hole at a recent teen activity and wound up making electronic music with Garage Band.) Or, share cuts from your respective music collections. Itâ€™s fantastic for fostering those wonderful, rambling conversations–conversations seemingly about nothing yet really about everything important.Â Give this book to middle schoolers or reluctant readers with an interest in music or history or to adults looking for a quick read on the topic. Speaking of music, it was this yearâ€™s summer reading theme and great fun.Â Teens and adults have one last opportunity to rock the library and wrap up summer reading for grades 6 and up.Â Join us this Tuesday, August 7, at 7:30 pm in the Joplin Public Library Community Room for a wizard rock concert with nationally-known band Tonks and the Aurors with Lauren Fairweather, founder of the Moaning Myrtles.Â Wizard rock consists of rock music with lyrics set in the Harry Potter universe. There will also be a writing workshop with Wizards in Space literary magazine an hour before the concert. These programs are free and open to teens and adults.Â Neither registration nor summer reading participation is required. Questions? Call the libraryâ€™s Teen Office at 417-623-7953, ext. 1027, or email teen@joplinpubliclibrary.org Â Â See you at the concert! Find in catalog–here and here.